Notre Dame’s Ben Mader gets introduced pregame. Coal Grove players wait to take the court. Notre Dame’s Tyler Speas gets ready during pregame warmups. 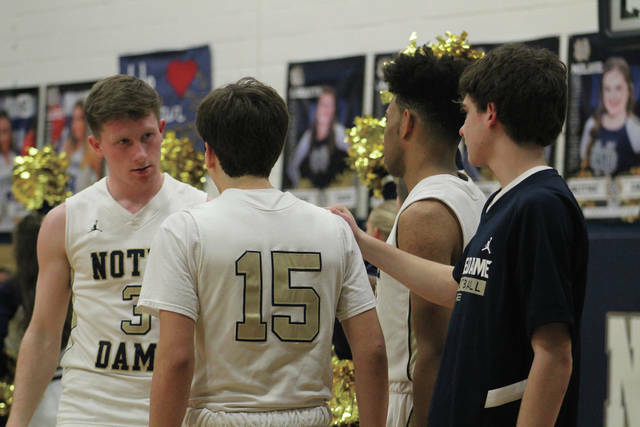 Excitement was aplenty on Tuesday night at Notre Dame High School as the senior athletes for the winter sports teams were honored before the Titans game against Coal Grove. On the court, it was the Hornets who frenzied Notre Dame in a 57-19 win. 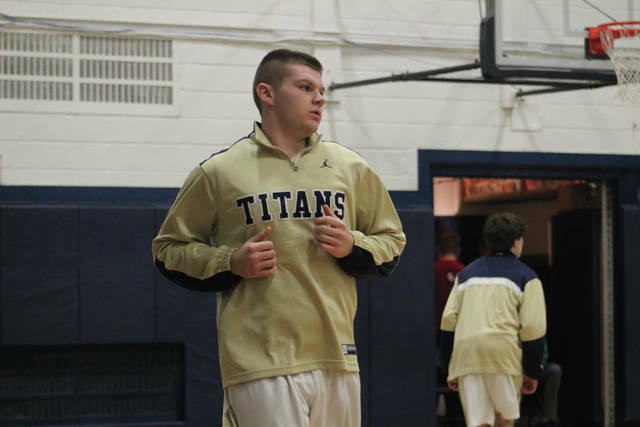 The game marked the last time on the home floor for Titans senior Tyler Speas. Speas is the lone senior on the roster this year for Notre Dame, and head coach Garrick Anderson says he has more than a few reasons to reflect on what Speas has brought to the program. In a short rotation that features as many as five freshman at times, Speas has been patient and more than willing to help his younger teammates grow. Often times, you see Speas coaching up fellow Titans during a stoppage of play. He never holds his head or gets frustrated with those around him, and demonstrates several characteristics of a great leader. “Speas has really bought in to that leadership role for these younger kids,” Anderson said. A major factor in the success Notre Dame has enjoyed this season and over the last four years, Speas will certainly be missed by Titans faithful and the community at Notre Dame once the season comes to a close. As for the action in the contest between the Titans and the Hornets, it was a tall task for Notre Dame entering the game. 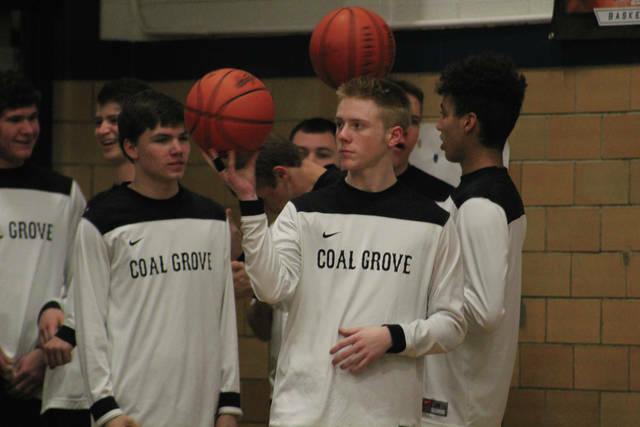 Coal Grove has a win over perennial power Oak Hill under their belt, and beat Gallia Academy by 20 earlier in the year. The Hornets have also defeated Portsmouth twice in OVC play, and received a number one seed in their tournament draw. Early, Coal Grove jumped out to a 6-0 lead. Back-to-back second chance points from Hornets senior Sam Angelo got the scoring going for Coal Grove, and began a rebounding pitfall for the Titans. In the first quarter, the Hornets had eight second chance points and seven offensive rebounds. For the game, Coal Grove outrebounded the Titans 35-18. The size and athleticism of players like Angelo (nine points overall) and Jeb Jones (10 points overall) were problematic throughout the night for Notre Dame. After one quarter, it was the Hornets up 14-6. Still hanging around in the second, the Titans trimmed the deficit to just five on their first possession when junior Ben Mader drained a three. Mader finished with a game-high 11 points in the contest, and continued his recent spurt for Notre Dame. “Ben has played well these last couple games for us, and when he gets going he’s tough to guard,” Anderson said. Following that three, though, things went south for the Titans in a hurry. Coal Grove coasted ahead on an 18-2 run from that point, and the Hornets got out fast on Notre Dame to lead 32-11 at halftime. The Titans got free throws from Mader with 4:57 to play in the second, but would go the rest of the quarter without hitting a field goal. Notre Dame shot 23 percent at the half, while in contrast Coal Grove shot 48 percent. The Hornets also turned the Titans over 13 times in the opening two quarters, leading to several fast break opportunities. It was a struggle from Coal Grove shooting the three-pointer early, as the Hornets missed their first nine attempts. Yet, they kept firing and the attempts paid off as Cory Borders and Angelo hit consecutive threes late in the quarter to extend the lead. Borders finished with 10 points overall, and was a part of a Coal Grove crew that had six players score six points or more in what was a very balanced scoring effort. In the third quarter, Notre Dame’s shooting woes continued. The Titans would get a lift from freshman Jackson Clark, who hit a corner jumper on the first possession of the third. Clark then hit a circus shot with 3:05 remaining, driving hard at the rim and getting the ball to bounce his way for a bucket. Clark totaled six points on the evening. The Hornets kept their scoring output going, outscoring the Titans 16-6 in the third. Giving Coal Grove a lift was senior Damien Giles off the bench, who scored five in the quarter. The senior would finish with eight overall. Through three, the Hornets were ahead 48-17. Scoring continued to be a struggle in the fourth, this time for both sides. As a result, the final score was 57-19 Coal Grove. Offense was hard to come by all night for the Titans, as they shot just 14 percent overall from the field on 6-for-43 shooting. It might be a tough one to swallow for Notre Dame, but the Titans have shown growth in the new year. All three of Notre Dame’s victories have come in the calendar year, and the Titans have also topped a couple SOC I schools as well as Ironton St. Joseph this season. The growth of Notre Dame has been apparent, as the young Titans have stepped up and developed as the season has wound down. Evident in the fact that Notre Dame continues to battle, ignoring their early season wounds to keep fighting at the right time of the year. Next up for the Titans is a game against New Boston on Friday, which offers another opportunity for Notre Dame to continue to grow before tournament play gets going next week.